Bridal Style I would describe my bridal style as romantic, but I also tried to keep it very classic. I wanted to look back on our photos in twenty or fifty years and still love how I looked just as much as on our wedding day. Dress By I wore a strapless Oscar de la Renta gown, purchased at L'elite in Boston and had a wonderful experience. I was the only one in the store and I felt like the girls really listened to what I was looking for. I got my alterations done through them as well and they did a beautiful job. I loved my dress so much but I ended up changing into my rehearsal dinner dress later in the night so I could dance more easily. It was a lace mid length dress by Self Portrait. Shoes by I chose flat sandals because I knew I'd never last in heels all night, especially on the grass. They were by Mystique and were super comfortable. Accessories by The only jewelry I wore was a pair of diamond earrings that I borrowed from my mom. The diamonds in my wedding band also came from a necklace my grandmother had given me, and I loved having these sentimental pieces as my accessories. Health secrets For me, stress plays a huge part in determining my physical health, so I tried my best to stay as relaxed as possible by staying organized. I was also very diligent about taking vitamins like Vitamin C and Lysine to keep my immune system strong in the weeks leading up to the wedding. Beauty secrets As a former esthetician, skincare was my number one priority. I used a Retinol mask once a week for the six weeks before the wedding and a Vitamin C serum daily. I was very careful to use sunscreen all summer to protect my skin, which is especially important when using retinol. I did a hair mask treatment once a week and used a Kevin Murphy hair serum to prevent frizz, which I am very prone to. I also made sure to use an exfoliating body scrub twice a week so my skin would look soft and smooth. Hair by I actually chose to do both my hair and makeup myself. I'm very picky and I'm never completely happy when I get them done professionally, so I decided to do it myself from the beginning. I made sure to do a ton of research and trials beforehand - YouTube tutorials were my best friend - to find and perfect the look I was going for. I think both came out really well, and I got to spend more time taking in the morning and enjoying time with my bridesmaids and family before the ceremony. Greatest Moment After the band finished we had the DJ play for another hour to keep the party going. When he played "Mr. Brightside" almost every person at the wedding got on the stage and the dance floor and sang along at the top of their lungs. It was just a really unexpected, fun memory to see everyone let loose together. It's exactly how we wanted our wedding to be. Wedding Venue My family's home in Milton. We loved having the ceremony, cocktail hour, and reception all in one place, and we didn't have to worry about being rushed out at the end of the night. It definitely took a lot of planning and organization, but we were so lucky in that my parents were absolutely amazing and it made them so happy to host such an incredible day. We made sure to warn our neighbors about the noise beforehand (and bribe them with cookies!) and they were so kind and understanding, many even offering their driveways for parking. We rented these beautiful clear tents to cover the yard, but since you could see the sky it still felt like an outdoor wedding, it was perfect. A few favorite vendors My favorite people to work with were our florist and our caterers. Krissy Price of Pollen Floral Design is kind, creative, and has the most beautiful aesthetic. She was wonderful to work with and she and her team made our yard look like a dream. The team from The Chef's Table, a catering company out of Marshfield, was our savior throughout the planning process. They came to our rescue when our rentals fell through a few months before the wedding and their support from start to finish made planning much less overwhelming and stressful. Their food is also incredible of course! Advice for brides to be? No matter how stressful planning may get, my advice for brides to be is to avoid becoming a "bridezilla." 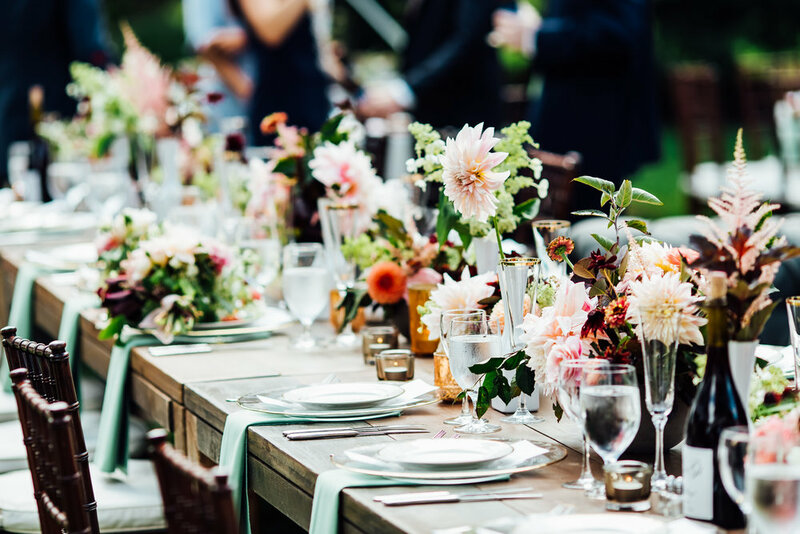 The family and friends helping and supporting you during this time are going to be there long after your wedding is over and there is no detail of your wedding worth alienating or hurting a loved one over. People may annoy you at times (including your fiance! ), but just try to take it in stride and remember, while your wedding is a wonderful day, it's just one day in a lifetime you'll share with the people you love. Posted on March 25, 2018 by Alexandra Hynes and tagged bride babe backyard wedding oscar de la renta LElite DIY DIY bride bridal style.